We celebrated my FIL's 88th birthday last Tuesday. We went there as soon as my husband came home from school. I baked a pan of lasagna and my friend Raquel brought Dad a chocolate cake. We also have some KFC chicken and later on my SIL prepared some gourmet meal. We did not stay very long because EJ was sick. We didn't get to bond with my SIL's family who came a little bit later. Here's EJ blowing the candle for Pap. Raquel surprised Dad a visit. Although she did not bring the baby, she brought her baby's album for Dad to see. Rylie made something for Pap too. She wasn't contented of the card we bought lol. Below was taken during the Grand Parents' Day Celebration at my FIL's back porch. 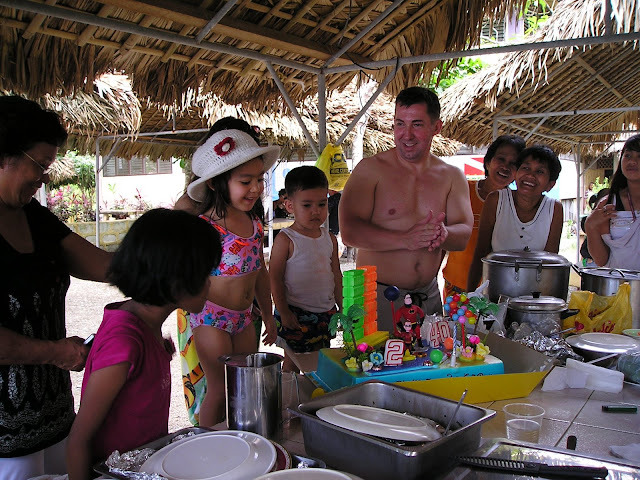 Below is one of the pictures that we took when EJ and John celebrated their birthdays in the Philippines. That was very memorable because it was my kids first visit in my home sweet home. We celebrated it at one of the beaches in Donsol and we also swam with the Butandings (Whaleshark). This is one of the photos that Mama is in (the one in white top). My brother Andy was still alive on this occasion. How I wish that Mama is just around the corner where we can visit everyday. 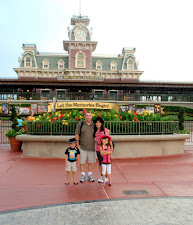 Linking this up to Mommy Moments with a Grandparents as a theme this week. Hello Rose! Yummy lasagna! Great gift kasi I am sue na super yum yum! Your kids are growing fast! Time flies! They're getting cuter everyday! Thanks for sharing the pics. Nagutom ako! hi..pasenysa na kung ngayon ko lang napagbigyan ang request mo sa akin na gawan kita ng tula..october 7, 2009 ng mag request ka at now ko lang napagbigyan ang request mo..i hope makita mo at mabasa,hehe..
rylie's so pretty! look at those eyes. Happy Grandfathers Day to your FIL! Happy 88th Birthday to your FIL. May he have many more blessed and abundant birthdays to come. You sure had a grand birthday celebration at your FIL's house. Thanks for the homey post. God bless you all always. aaawww...bigla akong na touch when you mentioned your mama..sure, na miss mo na talaga.. how i wish, uuwi din kame province and mother is there waiting for us.. anyways... napa sweet naman ni rye.. di talaga contented sa card. tama, personal touch ba.. hihi.. how's rye now.. i mean ikaw pala sis kasi tayo ang affected sobra when they miss one in school. ahhh wait, i'll look for that entry.. nsa grandparents theme pala tayo.. hihi..:) happy grandparents day to your FIL! Happy 88th b'day to your FIL. 88 means double prosperity in Chinese. Wow! 88 years old and still looking groovy! Your kids are lucky to have him around. Happy Mommy Moments! So sweet of Rylie to gave her Paps a very personalized gift...so touching! Cute talaga ng mg anak mo, Rose...glad you all had fun at your FIL bday. So sweet of her to make a card herself! Belated Happy Birthday to your FIL!! Belated happy birthday sa FIl mo, ROse. Aww, ang bibo nang photos mo. Many happy faces! that is so so sweet of ryle your father in law had a blast..
yum, lasagna is one of my favourites! Hi Ate Rose. I miss you. Pasensha na ha, busy busyhan. As usual ang dami ko na naman namissed. I'll definitely catch up. Belated happy birthday sa FIL mo. Kelan nyo balak uwi ulit ng Pinas? Rylie is so big na, 2 weeks lang ako di bumisita parang nalakihan ako sa kanya hehe..
sweet kids, one big happy family. blessed you are to have them.. happy MM! Belated happy bday to your FIL! Sweet naman ni Rylie gumawa talaga ng personal greeting card nya for lolo!